This Sculpture is a 3D Printing representation of Brett Ryder's quintessential illustration of 3D Printing titled the Third Industrial Revolution for the Economist. This beautiful illustration was made into 3D Printing reality using SLS Sculpteo White Plastic. 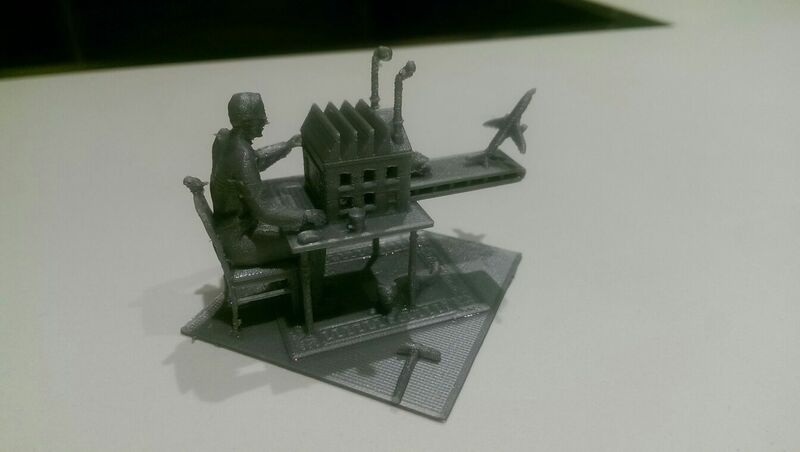 This Sculpture is a 3D Printing representation of Brett Ryder's quintessential illustration of 3D Printing titled the Third Industrial Revolution. This beautiful illustration was made into 3D Printing reality using Sculpteo White Plastic. The 3D model was designed to be printed on an SLS or a Resin machine. It has not been tested on an Ultimaker or other FDM Printers. This printed fantastic! I estimated my filament wrong and ran out of gold PLA just before the smoke on the smokestacks, but otherwise, I think this turned out beautifully. @XYZWorkshop: Nice to hear you're getting an UM3! B.t.w. tagging used to exist but made maintaining it a bit too complex in conjunction with formatting of the messages. But I am "subscribed" to the thread now that I've replied with the "Follow" checkbox left checked. Eric do you know how do i tag users in my comments in youmagine? @ErikdeBruijn thanks for sharing! awesome to see it printed on the Ultimaker 3. Amazing it printed all the small complex geometries. cant wait to try it on my UM3. It came out pretty nicely! I would probably print it a bit bigger, this was only approx. 6-8 cm high. The hammer is almost separate from the rest of the structure. I don't know whether it broke off or whether it wasn't even touching the rest. Could be either, but having it sunk into the rest a bit more. It's a really nice model, I totally love it. I was wondering if you'd mind if I added the STL version for this file as a document. Currently this is an option to download it as an STL, but most people will simply press "Download" and find that it doesn't open in any program. Also, the binary STL is 12 MB as opposed to the OBJ which is 40 mb.